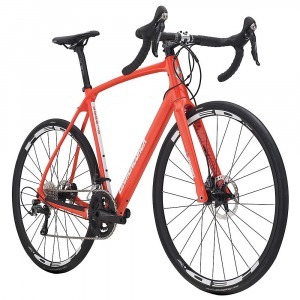 Diamondback is a company that has made a name for itself in the field of cycling, mainly for the cheap, high quality mountain bikes that roll off its assembly lines. The Haanjo is a gorgeous trail bike from the company that is able to withstand the stresses of the harsh trail while maintaining speed and finesse. We took a look at the Diamondback Haanjo because of the many positive reviews we had heard about it. The bike is surprisingly affordable, although it definitely isn’t cheap. With the components on it though, we weren’t surprised that it wasn’t cheap – a Shimano Ultegra gear set was standard on the bike, along with a nice carbon fiber fork that looked really good on the aluminum frame. The handlebars were another source of joy for us. They were flared and had a shallow drop as well, providing us with a high level of control during our rougher trails, with braking provided by some great TRP disc brakes. We did have a couple of complaints about the bike too, including a saddle that didn’t feel nearly as comfortable as it could have been. The crank set also wasn’t the best, as there were many issues with the power transmission from pedal to wheel, but it was an overall awesome ride, full of adventure and precise control. If you are looking for an affordable alternative to those high end trail and mountain bikes out there made for adventure, the Haanjo Trail bike is perfect for you. We had a ton of fun on the Diamondback Haanjo Trail. It was a great bike overall, although it could have been better spec’d out. For the price you pay though, this is a trail bike that provides amazing value for money.